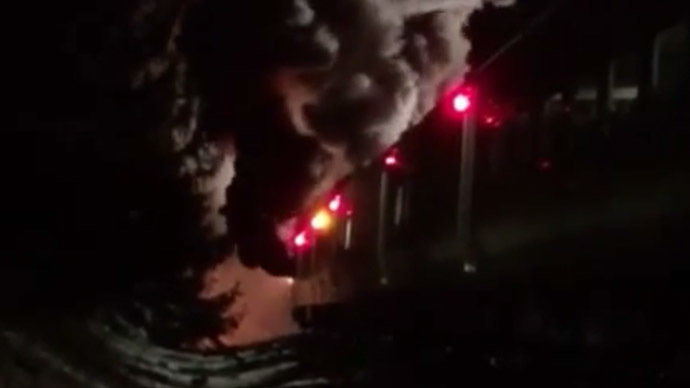 At least six deaths and numerous injuries have been reported after a Metro-North train crashed into a car in Valhalla, New York, and caught fire on Tuesday. At least 12 people have been injured in the accident so far, according to The Journal News. New York Gov. Andrew Cuomo confirmed on CBS This Morning that six people have been killed, and authorities said at the time that they were responding to a "mass casualty" situation. Between 750 - 800 people were on the train at the time of the crash, WABC reported, and NBC News stated that it was "packed with commuters." The crash occurred around 6:30 pm Tuesday evening, when it hit a vehicle at the Commerce Street crossing and dragged the car for about 150 yards. The Journal News stated that the train struck two cars, both of which caught on fire. The train itself also caught on fire. On Twitter, reporter Khurram Saeed said that the fatalities included the driver of one of the vehicles, a woman whose SUV had been stuck on the tracks. Metro-North spokesman Aaron Donovan said that passengers were evacuated through the train's rear doors. In one case, a Twitter user noted that passengers opened an emergency door themselves and jumped out onto the tracks. The Harlem Line, which the train was running on, has been temporarily suspended from North White Plains to Pleasantville. Multiple police departments and transportation agencies responded to the situation, as well as several fire departments.